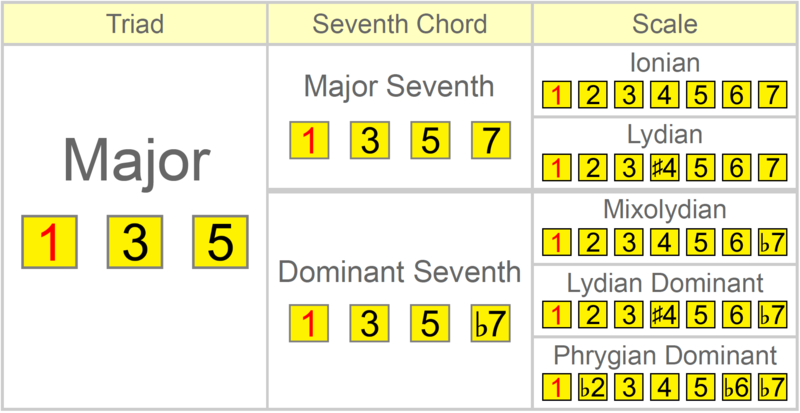 As a seven-tone scale we can use to accompany major and major 7th chords. As a harmonic system and mode of the major scale. But more broadly, Lydian encompasses a specific musical flavour that composers use to evoke certain emotions and feelings. First, let's consider Lydian in the context of a seven-tone (heptatonic) scale. There are countless examples of Lydian's magic being used in music, some subtle, some more explicit. And it shows up in the strangest of places. A beautiful and iconic use of Lydian can be heard in the Sony/Columbia Pictures ident, which really captures the essence of the Lydian sound. Can you hear the instances of the ♯4? The interesting thing about this short piece is how it crashes from C Lydian (over a C major backdrop) into E Lydian (E major backdrop). This demonstrates how powerful Lydian is in making shifts in major harmony all the more dramatic! Now, you'll notice that the root chord of Ionian is also a major 7th. But composers have often favoured Lydian for major 7th chords because of how the augmented 4th colours the chord. More generally, however, Ionian tends to be used for the major key tonic, with Lydian covering any major 7th chords that might occur away from it. Of course, the chord being played doesn't have to be a major 7th for Lydian to work, but this is where your judgement comes in. By training your ears to Lydian's sound, specifically that augmented 4th interval, you'll have a better idea when to use it in a chord progression. 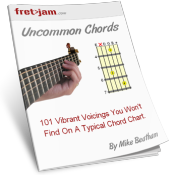 You can explore this concept of connecting chords and scales (or harmony and melody) in great depth in my Chord Connections course. So when the ♯4 is voiced in the major or major 7th chord, Lydian is a good scale choice. Lydian can also be seen as the 4th mode of the major scale. This means that we can use our knowledge of the major scale's pattern to cover Lydian, meaning you don't have to learn an entirely new pattern. 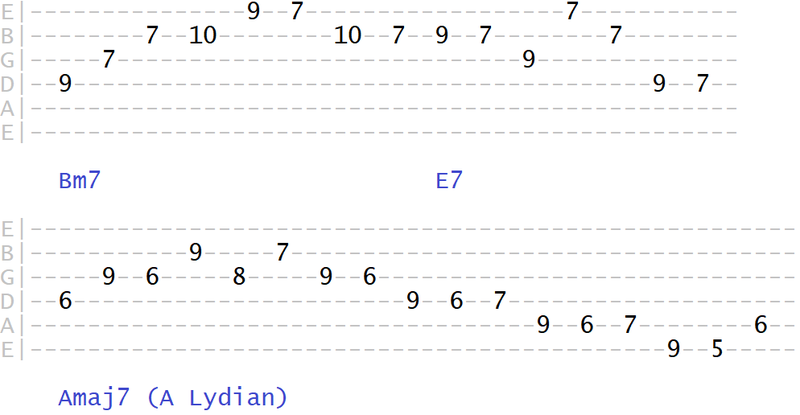 We can use a simple visualisation trick to connect the Lydian root to its parent major scale pattern. Another way to see it is using what we might call Lydian's first position box. When playing through scale patterns, be aware of the position of defining colour tones such as the #4 in Lydian and how they relate to the triad tone positions. That's the 1, 3 and 5. By developing this kind of spatial awareness, you'll be able to target such tones more confidently. Remember that, as Lydian uses the same notes and pattern as its parent major scale, we can essentially reharmonise our major scale licks, or any relative mode of that parent major scale, for use with Lydian. For example, if we were playing over an F major chord, any of our C major, D Dorian, E Phrygian, G Mixolydian or B Locrian licks could be used to get the Lydian sound. Finally, let's focus on how Lydian creates movements of harmony from its interval structure. This movement between two major triads a whole step apart is a very common Lydian based movement you'll hear in music. When you hear such a movement, Lydian is the implied mode. And we'd use the same 7th chords for Lydian's I and II chords as we do the major scale's IV and V. The only difference with Lydian is that we resolve around the IV of the major scale instead of the I. 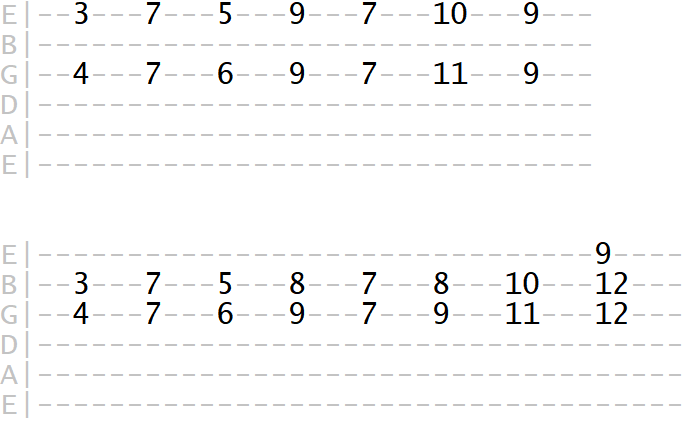 You can try this simple Lydian movement on the open chords of E, A and D by moving the fretted shape up two frets. The main thing to grasp here is that we're still essentially melodicising and harmonising the major scale, but the center of musical gravity has shifted to its 4th degree and its IV chord, hence 4th mode Lydian. More importantly, you should be able to recognise the Lydian sound in such movements of harmony and melody by ear. It might awaken a particular feeling or emotion and it's these signifiers that you should seek to internalise as you explore the mode. For more help with connecting harmony and melody, take a look at my Chord Connections course, where I take you through the foundations of how scales and chords are intrinsically connected.